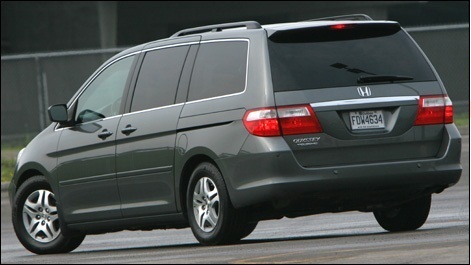 Honda Motor Company of Japan is recalling 344,187 North American market Honda Odyssey minivans for safety concerns related to sporadic“hard braking.” The recall affects units produced in 2007-2008. According to Honda of North America, owners will have to wait until spring 2014, for dealership parts availability. Speaking with Kendal Auto Group of Eugene and Portland Or., I discovered that Honda has not advised its dealership networks as to the November recall. But ,what service advisers do know is that they do not have the parts in stock to address the disclosed issue. According to Kendal, original owners of record will be notified by Honda via mail as to process and time-line developments. For secondary owners of Odyssey minivan, Kendal recommends that they contact Honda of North America, and register for participation in the recall. Without the registration, the process will be delayed for months and directed through state D.M.V. records of title. For those that wish to participate in the recall, Honda has provided a consumer hot line. The number is: 1-800-999-1009. Please retain this specific recall # JC5 for possible brake issue. You may also wish to check your vehicle for additional recall notifications and related repair information on the company website. This recall is being enacted in cooperation with the United States National Highway Traffic Safety administration. The possible braking malfunction follows an announced recall in September involving 342,000, 2003-2004 Odysseys. The September recall is attributed to a “sound sensitive”computer chip relay malfunction in the automobiles air bag controller. Honda technicians report that it’s possible for sound signals coming off of an unrelated electronic component to deploy the airbag without warning. Hand and face abrasions have been attributed to these unanticipated airbag deployments. According to Kendal Auto Group, the fix in this case is a relatively easy one requiring the installation of an electronic noise filter in the airbag controller. While the installation requires less than an hour, as with any dealership service call, consumers are advised to call ahead for availability and time-line. You may anticipate leaving your vehicle with dealership service for the better part of a day. According to Kendal, next day service is possible with an early morning advanced booking. With sign in, rotation, install and release, plan on spending no less than 3 hours at the dealership. Although no traffic accidents have been attributed to either recall, the possibility for accidents does exist, and, Honda has opted to take the high road as to accident prevention. In all fairness to Honda, it may be noted that the Odyssey is the highest rated mini van in the United States. Its rated #1 by Kelly Blue Book professional and other consumer watch groups in overall consumer satisfaction, safety and reliability. Produced since 1990, the Honda Odyssey is in it’s 4th generation and counts millions of satisfied owners world wide. This ever -evolving Honda remains an impressive, quality, good value benchmark in the ever changing world of automotive design. In fact, the 2014 Honda Odyssey is the first minivan with top safety pick+ rating. Thank you for this information. I can now notify my sister who recently purchased a used Odyessy. You are most welcome Nking. Thank you for reading TorqueNews.